Methods: This phase IV, prospective, single-arm, open-label, 12-week study enrolled subjects aged ≥18 years with eye dryness score ≥40 (0–100 VAS) and tear osmolarity ≥308 mOsm/L. Subjects were prescribed lifitegrast ophthalmic solution 5%, twice daily in each eye. DED symptoms were assessed via VAS at baseline and 2, 6, and 12 weeks. Signs included tear osmolarity, meibomian gland dysfunction, tear breakup time, and fluorescein corneal staining. In post-hoc analysis, subjects with ≥5 mOsm/L decrease in osmolarity over 12 weeks were Responders. Results: Of 26 subjects in the intent-to-treat population, 23 were female; mean age was 67.4 years. Baseline mean±SD eye dryness was 68.7±16.5 and tear osmolarity was 317.8±8.5 mOsm/L. All seven symptoms (dryness, burning, foreign body sensation, pain, photophobia, itching, blurred vision) declined significantly (P<0.01) from baseline to 6 and 12 weeks. Signs did not change significantly. For 13 Responders, tear osmolarity decreased from baseline to 12 weeks (319.2±8.5 to 300.6±12.3 mOsm/L, P<0.001) and corneal staining trended toward improvement (1.1±0.9 to 0.6±0.7, P=0.136). Among Nonresponders, osmolarity increased from 316.4+8.7 to 329.6+13.9 (P<0.01) and corneal staining showed no change (1.3±0.8 to 1.0±0.7 at 12 weeks, P=0.293). Conclusions: Lifitegrast reduced DED symptoms among subjects with moderate-to-severe disease (severity defined by VAS for eye dryness). Potential reasons that may underlie the dichotomous effect of drug treatment on tear osmolarity are discussed. In an analysis of commonly used objective clinical tests for DED, tear osmolarity was the most stable measure and also the most sensitive to changes in tear physiology.3 In a 3-month observational case series study of 10 patients with severe DED, tear osmolarity declined significantly from a mean of 341 mOsm/L to 307 mOsm/L after treatment with cyclosporine A, whereas other signs did not exhibit a statistically significant treatment response.3 Similarly, 1 month following cataract surgery in 30 subjects (60 eyes) randomized between topical cyclosporine A 0.05% emulsion and 0.5% carboxymethylcellulose drops, a statistically significant reduction in mean tear osmolarity was demonstrated favoring the cyclosporine A group over the carboxymethylcellulose cohort, along with similar statistically significant improvement in ocular surface staining, tear breakup time (TBUT), and Schirmer’s I testing.12 In another study of 105 patients with DED, tear osmolarity declined from a mean of 326 mOsm/L at baseline to 307 mOsm/L at 12 weeks after treatment with omega-3 nutritional supplements, a reduction that was statistically greater than with placebo.13 Similar reduction in tear osmolarity, averaging 18.6 and 19.8 mOsm/L, respectively, was reported following a 3-month daily dose of krill oil and fish oil supplements, with olive oil supplementation, serving as the placebo control, showing no significant reduction (average change 1.5 mOsm/L).14 In these and other studies, analysis based on the eye with the worse/more severe measurement at each time-point provided a more sensitive test and also a more stringent requirement for assessment of response.3,13–19 Tear osmolarity emerged in these and other studies13–19 as a precise objective measure to quantitatively track the effects of diverse DED therapies. A decline in tear osmolarity after initiating treatment emerged as a leading indicator of subsequent improvement in other signs and symptoms. Given the established utility of tear osmolarity to track effects of DED therapies,3,12–19 it would be of interest to measure changes in tear osmolarity over the course of lifitegrast therapy and assess the relationship of tear osmolarity to overall changes in symptoms and signs of DED. The purpose of this study was to test the hypothesis that a fall in tear osmolarity would be a leading indicator of a subsequent decrease in symptoms in patients with DED treated with topical lifitegrast therapy and followed for 12 weeks. This was a phase IV, prospective, single-arm, open-label, 12-week, longitudinal study (ClinicalTrials.gov identifier: NCT03451396) conducted between December 12, 2016 and March 15, 2018. The study was conducted at two sites in the USA under the approval of the Sterling Investigational Review Board (Atlanta, GA, USA). The study adhered to the principles of the Declaration of Helsinki. Up to 30 subjects were intended to be recruited, in two groups of 15 subjects each. All subjects were ≥18 years of age and had been diagnosed with DED with VAS score for eye dryness ≥40 (0–100 scale). In Group 1, subjects had tear osmolarity ≥308 and <320 mOsm/L in at least one eye. In Group 2, subjects had tear osmolarity ≥320 mOsm/L in at least one eye. Subjects had to be willing to adhere to twice-daily (b.i.d.) dosing and the follow-up visit schedule, and agree not to otherwise change their medication regimen. Exclusion criteria included a history of ocular pathology, degeneration, or allergy; receipt of any T-cell modulatory therapy; instillation of artificial tears within 2 hours of study visit; contact lens use; eye or eyelid surgery in the past 6 months; change in dry eye therapy in the past 2 months; and participation in any concurrent clinical trial. All subjects completed an informed consent form indicating their voluntary participation in the study. At Visit 1, eligible subjects were prescribed lifitegrast ophthalmic solution 5% (Xiidra®; Shire, a Takeda company, Lexington, MA, USA), one drop b.i.d. in each eye. Investigational product compliance along with any possible adverse events was reviewed with the subject at each visit. Treatment was maintained for the duration of the 12-week study period. Subjects were instructed not to change their habitual use of medications, artificial tears, or supplements when starting the study drug. Xiidra (lifitegrast ophthalmic solution) 5% is a lymphocyte function-associated antigen-1 (LFA-1) antagonist supplied as a sterile, preservative-free, clear, colorless to slightly brownish-yellow colored, isotonic solution of lifitegrast with a pH of 7.0–8.0 and an osmolality range of 200–330 mOsmos/kg in single-unit-dose ampules. The active ingredient in Xiidra is lifitegrast 50 mg/mL; the inactive ingredients are buffered saline comprised of sodium chloride, sodium phosphate dibasic anhydrous, sodium thiosulfate pentahydrate, sodium hydroxide and/or hydrochloric acid (to adjust pH), and water for injection. Symptoms of DED were measured by the VAS, a subject-reported index in which each item is reported on a 0–100 scale (0 = none; 100 = severe). Items included eye dryness, burning/stinging, foreign body sensation, pain, photophobia, itching, and blurred vision. 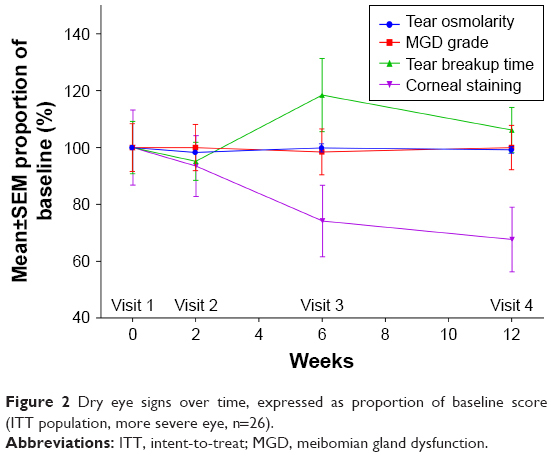 Signs of DED were measured by tear osmolarity (measured as mOsm/L using the TearLab™ Osmolarity System), meibomian gland dysfunction (MGD) grading (0–5 scale; visual grading of meibomian gland clogging on examination and expression), TBUT (the timing of the breakup of the precorneal tear film [in seconds] following a blink), and fluorescein corneal and conjunctival staining score (0–5 scale; area and density of cornea and conjunctival staining with fluorescein dye uptake accessed via slit-lamp examination using a cobalt blue filter, using the Oxford scheme as described by Bron et al32). Meibomian gland function was graded as follows. Grade 0 indicated normal-appearing, functioning meibomian glands with clear oil discharge and no dropout or plugging. Grade 1 demonstrated only subclinical changes with altered meibum quality on expression and no gland dropout. Grade 2 showed minimally altered quality of expressed meibum from scattered glands with minor gland loss. Grade 3 demonstrated mildly altered meibum quality, occasional lid margin signs, and mild gland loss. Grade 4 showed moderately increased opacity and viscosity of meibum, plugging, increased marginal vascularity, loss of orifice definition, and moderate gland loss. Grade 5 indicated moderately increased opacity and viscosity of meibum, plugging, increased marginal vascularity, loss of orifice definition, and moderate gland loss. Osmolarity tear testing preceded all other diagnostic examinations, testing, staining, and instillation of study eye drops. Procedures followed the TearLab instruction guide, using a lab-on-a-chip system to simultaneously collect and analyze the electrical impedance of a 50 nL tear sample from the inferior lateral tear meniscus. Osmolarity was measured in both eyes, and data analysis is based on the eye with the higher reading at each time-point. For quality control, each Tear Lab pen was tested and recorded each day using the electronic check card as well as with an osmolarity test card on the high-osmolarity control solution, as per the TearLab instruction guide. Study measurements were made at baseline (first clinic visit; Visit 1) and 2 weeks (Visit 2), 6 weeks (Visit 3), and 12 weeks (Visit 4) following initiation of lifitegrast therapy. Compliance to study medication was confirmed at each visit, along with documentation of any adverse events. The intent-to-treat (ITT) population included all subjects who received at least one dose of investigational product. All efficacy analyses were performed on the ITT population. In the ITT population, descriptive statistics (mean and SD) were calculated for each visit. Signs and symptoms at each visit were compared with baseline (Visit 1) and previous visits using a two-tailed Student’s t-test. Signs were compared using the more severe eye at each visit to improve sensitivity, given the small sample size. The planned enrollment of 30 subjects included a 20% attrition to achieve >80% power based on an alpha error of 0.05, a mean reduction in tear osmolarity of 10 mOsm/L, and SD of 8 mOsm/L. For the responder analysis, which was conducted post hoc, subjects were classified according to improvement in tear osmolarity. Those who experienced a ≥5 mOsm/L decrease in tear osmolarity from baseline to 12 weeks were classified as Responders, and those who experienced <5 mOsm/L reduction or increase in osmolarity from baseline were Nonresponders. Descriptive statistics and visit-to-visit comparisons as described in the ITT analysis were repeated within these two groups. Baseline differences in signs and symptoms were compared between the groups to identify a physiological basis for Responder status. In total, 30 subjects were enrolled, 15 in each group. Four subjects withdrew consent before the end of the study. In Group 1, one subject did not feel that their condition improved and discontinued study medication. In Group 2, three subjects withdrew owing to adverse reactions (burning, burning and blurred vision, and marginal ulcer). Overall, 26 subjects completed the study and were included in efficacy analyses (ITT population). Of the 26 subjects in the ITT population, 23 were female, and mean±SD age was 67.4±9.6 years. Of all subjects, 24 were white/Caucasian, one was black, and one was Hispanic. All subjects had been on a steady, ongoing regimen without changes for a minimum of 3 months prior to study enrollment. At baseline (Visit 1), mean±SD symptom scores were dryness, 68.7±16.5; burning, 50.0±24.4; foreign body sensation, 47.7±32.1; pain, 33.3±34.7; photophobia, 51.9±34.7; itching, 49.2±31.0; and blurred vision, 54.0±30.4, each out of 100. Mean±SD baseline levels for signs (more severe eye) were tear osmolarity, 317.8±8.5 mOsm/L; MGD grade, 2.5±1.1 out of 5; TBUT, 4.9±2.3 seconds; and corneal staining score, 1.2±0.8 out of 5. Statistically significant (P<0.01) reductions from baseline (Visit 1) in VAS scores were observed for all seven symptoms at 6 weeks (Visit 3) and 12 weeks (Visit 4) (Figure 1). At 2 weeks (Visit 2), dryness, burning, foreign body sensation, pain, and itching scores were significantly lower than at baseline (P<0.05). Similar findings were observed when the two groups were stratified according to osmolarity (≥308 mOsm/L and ≥320 mOsm/L). 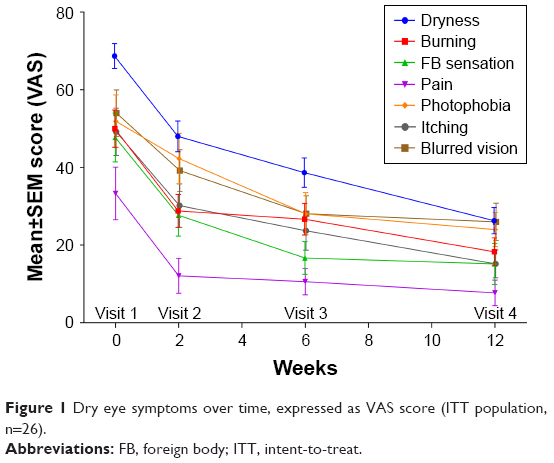 Figure 1 Dry eye symptoms over time, expressed as VAS score (ITT population, n=26). Abbreviations: FB, foreign body; ITT, intent-to-treat. Measures for signs did not differ significantly from baseline at any time-point (Figure 2). There was a downward trend for tear osmolarity at 2 weeks (P=0.080 vs baseline), but this trend was not sustained over 12 weeks. There was a downward trend for corneal staining (P=0.070 at 12 weeks vs baseline). No statistically significant differences were noted when stratifying the groups according to osmolarity. Figure 2 Dry eye signs over time, expressed as proportion of baseline score (ITT population, more severe eye, n=26). Abbreviations: ITT, intent-to-treat; MGD, meibomian gland dysfunction. Of the 26 subjects, 13 met the Responder criterion and 13 were Nonresponders. For Responders, mean±SD tear osmolarity decreased significantly from 319.2±8.5 mOsm/L at baseline to 300.6±12.3 mOsm/L at 12 weeks (P<0.001 vs baseline) (Figure 3). For Nonresponders, mean±SD tear osmolarity increased from 316.4±8.7 mOsm/L at baseline to 329.6±13.9 mOsm/L at 12 weeks (P<0.01). 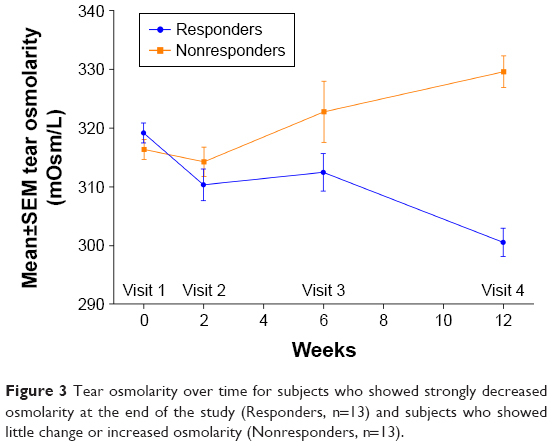 Figure 3 Tear osmolarity over time for subjects who showed strongly decreased osmolarity at the end of the study (Responders, n=13) and subjects who showed little change or increased osmolarity (Nonresponders, n=13). For Responders, mean±SD corneal staining score trended toward improvement from 1.1±0.9 at baseline to 0.6±0.7 at 12 weeks (P=0.136 vs baseline) (Figure 4). Nonresponders experienced a smaller numeric reduction in mean±SD corneal staining score, from 1.3±0.8 at baseline to 1.0±0.7 at 12 weeks (P=0.293). 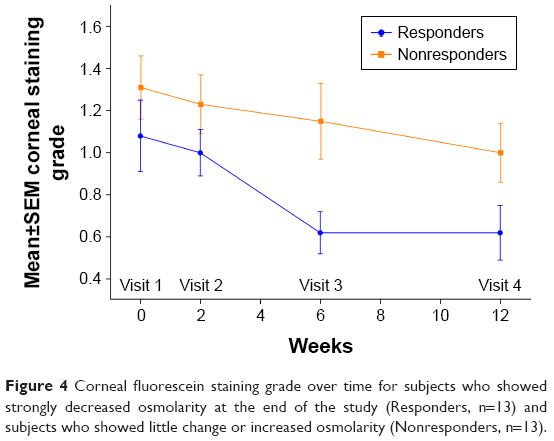 Figure 4 Corneal fluorescein staining grade over time for subjects who showed strongly decreased osmolarity at the end of the study (Responders, n=13) and subjects who showed little change or increased osmolarity (Nonresponders, n=13). Responders also showed a trend toward higher photophobia scores at baseline (mean VAS score 61.9) than Nonresponders (mean 41.9; P=0.145). 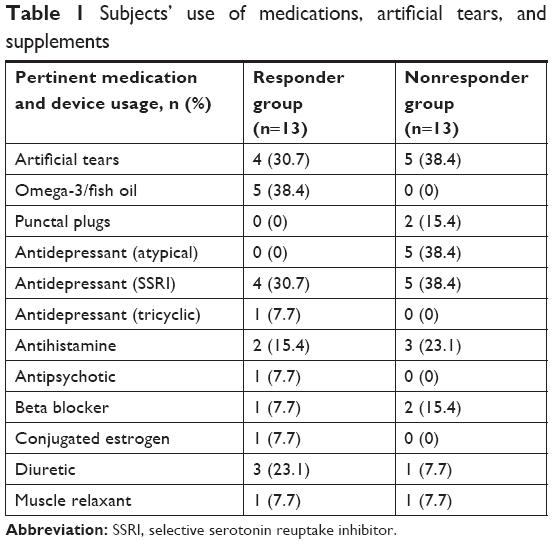 Table 1 lists the distribution of pertinent medications, supplements, and artificial tear use in the Responder and Nonresponder cohorts. Two subjects in the Nonresponder group had plugs placed in both lower lid puncta more than 1 year prior to study enrollment. Abbreviation: SSRI, selective serotonin reuptake inhibitor. In this 12-week study, a statistically significant reduction from baseline in symptoms measured by VAS was uniformly observed in the ITT population across seven symptoms at 6 and 12 weeks after initiation of lifitegrast therapy (Figure 1). This statistical difference emerged at 2 weeks after baseline for five of the symptoms: dryness, burning/stinging, foreign body sensation, pain, and itching. The marked reduction in symptoms persisted for the full 12 weeks of the study, making it unlikely that this was a transient placebo effect. In contrast to the findings for symptoms, there was no significant improvement in any sign over the course of the study (Figure 2). In analyzing the ITT group as a whole, the results failed to support the hypothesis that tear osmolarity was a reliable leading indicator for a subsequent fall in symptoms or signs in patients with DED given a 12-week course of topical lifitegrast. In a post-hoc analysis, the subset of subjects who responded to lifitegrast therapy with improvement in tear osmolarity also showed a trend toward reduction in corneal staining, whereas both Responder and Nonresponder groups showed a statistically significant reduction in seven symptoms over the 12-week study. It is possible that these divergent results could indicate that a longer treatment duration might be required in the Nonresponder group to show a statistically significant reduction in corneal staining or tear osmolarity, or that other inflammatory signs may be better aligned with the core mechanism of lifitegrast. While in vitro studies indicate that lifitegrast inhibits the activation and recruitment of T cells and the release of pro-inflammatory cytokines,21,23,24 the exact mechanism of action of lifitegrast in DED remains unknown. In an attempt to explain both the high efficacy of lifitegrast in quickly and uniformly reducing DED symptoms in subjects of this study and the paradoxical dichotomous effect on tear osmolarity, we propose the following testable hypothesis. Perhaps lifitegrast could be more uniformly directly or indirectly affecting corneal neurosensory function in patients with moderate-to-severe dry eye symptoms in addition to competitively blocking the LFA-1/ICAM-1 synapse. Notwithstanding this proposed neurosensory effect, Responder and Nonresponder groups could differ in levels or markers of inflammation and apoptosis, and thereby respond differently to this drug in terms of tear osmolarity and possibly corneal staining. An intriguing observation, in line with the hypothesis that lifitegrast could in some way affect corneal neurosensory function, is that Responders also had higher photophobia scores at presentation. Whereas photophobia is a symptom commonly associated with dry eye, it has been suggested that dry eye patients with photophobia may have a more severe form of dry eye than their counterparts without photophobia, and they may also be more likely to have a component of neuropathic pain.33 This finding and its association with the Responder group deserve additional future study. The overall strong effect of lifitegrast for symptoms of DED in this study, alongside the lack of effect for signs, is not surprising given the pattern of results in earlier lifitegrast clinical trials. As in the OPUS-2 trial,27 this study enrolled subjects with moderate-to-severe DED (baseline eye dryness score ≥40) and found a significant effect for symptoms but no effect for signs. As Holland et al argued, 12 weeks may be too short a time period to overcome underlying conditions and demonstrate objective improvement in the eye surface.28 It is also possible that subjects who experienced a relief of symptoms may have discontinued artificial tears or omega-3 supplements, counteracting any effect of lifitegrast on signs. That explanation seems less likely in our study, as we recorded both prescription and over-the-counter systemic medications, drops, and supplements at every visit, and emphasized the importance of not changing the dosing; however, other ophthalmology drug studies have documented poor compliance with drug instructions even when patients report otherwise.34 An effect for signs may also be difficult to demonstrate in a study with a small number of subjects. Indeed, there was a trend toward improvement in corneal staining (P=0.070 at 12 weeks vs baseline), but the effect failed to reach significance. It is well recognized that objective signs and subjective symptoms of DED are not well correlated,35 so it is not surprising to demonstrate an effect for symptoms that are not accompanied by improvement in signs. Examination of findings for Responders (subjects who experienced a strong improvement in tear osmolarity) may shed further light on the pattern of response to lifitegrast in this study, which was the purpose of performing this post-hoc analysis. Among Responders, mean corneal staining scores were stable until after Visit 2, after which staining scores reduced markedly between 2 and 6 weeks, for an overall numeric reduction of ~0.5 grades by 12 weeks (Figure 4). The improvement in the Nonresponder group, on average, was less than half a grade of staining, which we consider clinically indistinguishable from the original grade. Given the small sample size, these data must be interpreted accordingly. The wide divergence in response for tear osmolarity between the Responder and Nonresponder groups (Figure 3) also reinforces the possibility that patients presenting with DED signs and symptoms may have differing underlying pathologies and disease etiologies.1 However, patients with predominantly aqueous or evaporative DED and combined mechanism DED may be mixed together in typical dry eye ITT groups. To further highlight the potential effects of such heterogeneity, Aragona et al found different expressions of MMP-9 and transglutaminase 2 and a differential response to steroid treatment among dry eye patients with Sjögren syndrome compared to those with MGD,36 and Perumal et al demonstrated differential expression of proteins in the tears of patients with aqueous-deficient versus evaporative DED.37 It is possible that Responders in our study represent a subtype of DED patients that could be characterized to identify patients who are most likely to benefit from lifitegrast therapy – perhaps those with particular inflammatory profiles. Future randomized, controlled studies using tear osmolarity and quantitative MMP-9 metrics in addition to other tear biomarkers may reveal additional information about the response to lifitegrast therapy in patients with different forms of DED. We also noted that five of 13 patients in the Responder group, but no Nonresponders, had been taking oral omega-3/fish oil supplementation, and studies have shown that initiating such supplementation may lead to a statistically significant fall in tear osmolarity as early as 4–6 weeks.13,14 In contrast to these studies, where oral omega-3/fish oil supplements had been newly initiated, leading to a relatively rapid fall in osmolarity, in our study these patients had been chronically on this supplement regimen for a minimum of 3 years and the difference in osmolarity between the two groups was not noted until week 12, at which point the Responder group was within the range of normal tear osmolarity. Given the chronic use of the same dosage of fish oil in this subset of the Responder group and the comparatively delayed time-course of the fall in tear osmolarity, it seems therefore unlikely that fish oil use represents a pertinent confounding variable that could explain the difference between Responders and Nonresponders. Also, there was minimal change in the grading of MGD in Responder and Nonresponder groups during the course of the study. Limitations of this study include the small sample size and lack of a control group. Whereas a placebo effect is a possible explanation for response to therapy in the absence of a control group, generally placebo effects are of short duration. Subjects in this study noted persistent improvement in symptoms over the 12-week study period, in confirmation of the OPUS trial results.8–24 Indeed, the entry criteria of this study closely paralleled OPUS-2 and the results regarding VAS for dry eye virtually mirrored the OPUS-2 results.27 The mean VAS for ocular dryness in this study was 68.7 and in OPUS-2 it was 69.45. At 2, 6, and 12 weeks, in both studies, the dryness VAS dropped by 20, 30, and 35 points. In contrast, in the OPUS-2 study, in the control group, treated with just the vehicle, the VAS for ocular dryness dropped by 13, 18, and 23 points at the same time-points, thereby creating a historical control group for the DED symptom VAS for the present study. In conclusion, the findings of this study add to the body of literature demonstrating the efficacy of lifitegrast for treatment of DED symptoms.24–28 Future research incorporating objective quantified measurement of inflammatory markers in the tear film may identify patients who will benefit most from lifitegrast therapy in reducing symptoms and/or signs, as well as the appropriate biomarkers to optimally monitor the results of therapy. This trial was compliant with the principles of the Declaration of Helsinki and the International Conference on Harmonization guidelines for Good Clinical Practices; it was registered at ClinicalTrials.gov (identifier: NCT03451396). Written consent was obtained from each patient prior to any study-related procedures at Visit 1. The study protocol and its amendments, and the informed consent form, were reviewed and approved by the Sterling Investigational Review Board (Atlanta, Georgia). The data sets generated and/or analyzed during the current study are not publicly available owing to the need to minimize risk to the privacy and confidentiality of research participants and ensure compliance with legal requirements for privacy and data protection, but are available from the corresponding author on reasonable request. The authors thank Lisa Baker, PhD, for medical writing support. This study was funded by an Investigator Initiated Research Grant (IIR-USA-001291) from Shire, a Takeda company to Midwest Vision Research Foundation. Dr Qazi is a consultant to OASIS Medical. Dr Pepose is a consultant to AcuFocus, Allergan, Bausch + Lomb, Johnson & Johnson Vision, Kala Pharmaceuticals, MG Therapeutics, Mimetogen Pharmaceuticals, Noveome Biotherapeutics, Ocunexus Therapeutics, Okogen, Shire, a Takeda company, Stuart Pharmaceuticals, Sun Pharma, and TearLab. Dr Qazi is a consultant to OASIS Medical. Dr Pepose also reports grants from Shire, a Takeda company, during the conduct of the study; and personal fees from Acufocus, Allergan, Bausch + Lomb, Johnson & Johnson Vision, Kala Pharmaceuticals, MG Therapeutics, Mimetogen Pharmaceuticals, Noveome Biotherapeutics, Ocunexus Therapeutics, Okogen, Shire, a Takeda company, Stuart Pharmaceuticals, Sun Pharma, and TearLab, outside the submitted work; Dr Devries is a consultant to Allergan, Bio-Tissue, BruderHealthcare, BVI Medical, Bausch + Lomb, Eyes 4 Lives, EyeGatePharma, Johnson & Johnson Vision, OCuSOFT, Ophthalmic Resources, RPS, RySurg, ScienceBased Health, Shire, a Takeda company, Sun Pharma, TearLab, and TearScience. Dr Devries also reports personal fees from Allergan, Sun Pharma, Shire, a Takeda company, TearLab, and Kala Pharmaceuticals, personal fees other from Bruder, personal fees from Bausch Health, nothing from Johnson & Johnson Vision, personal fees from EyeVance Pharm, and other from Ophthalmic Resources, outside the submitted work. Xiidra [Prescribing Information]. 2017. Available from: https://www.shirecontent.com/PI/PDFs/Xiidra_USA_ENG.pdf. Accessed May 23, 2018. Holland EJ, Whitley WO, Sall K, et al. Lifitegrast clinical efficacy for treatment of signs and symptoms of dry eye disease across three randomized controlled trials. Curr Med Res Opin. 2016:32;1–7. Kass MA, Gordon M, Meltzer DW. Can ophthalmologists correctly identify patients defaulting from pilocarpine therapy? Am J Ophthalmol. 1986;101:524–530.